JAZEERA Airways and the Cyprus Tourism Organisation (CTO) said they had entered into a first of a kind agreement to promote Cyprus in Kuwait and the Gulf. The agreement, which was signed by Jazeera Airways chairman and CEO Marwan Boodai and CTO president Panos Englezos in a joint Press conference in Nicosia, is the first agreement between an airline in the Middle East and a tourism organization in Europe. 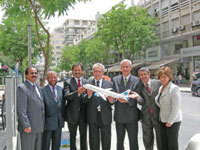 Jazeera Airways is the only airline that operates year-round scheduled flights between Kuwait and Cyprus. Boodai said: “We will work with the CTO to achieve both our objectives, and together with the CTO we will continue to attract Kuwaiti tourists to fall in love with Cyprus all over again. Cyprus is a beautiful European island that is known for its café culture, stunning beaches, and great people; you can’t help but fall in love with it.” CTO President Panos Englezos said: “We are excited about our new partnership with Jazeera Airways, which will re-introduce Cyprus to tourists from Kuwait and Dubai and attract them to re-kindle their love for Cyprus.” Bookings to the island took off when 18-month old Jazeera Airways started flights to Larnaca earlier this year. ETIHAD Airways is to enhance significantly the in-flight travel experience with the introduction of a new interactive Airshow TV channel. The new channel will be launched as part of Etihad’s in-flight entertainment system in June across its fleet of aircraft. It allows each passenger to view flight path, destination and flight information, all in extensive detail, high definition and on-demand. A second upgrade is scheduled for 2008 and will offer passengers live network news feeds, airport arrival and connecting gate information, airport terminal maps, and destination city guides. ABU Dhabi-based Al Yasi Group has launched Prestige Jet, a private jet aviation company. The service will operate out of Abu Dhabi and Dubai International Airports. The new company currently has two leased aircraft in its fleet, a 10-seat Bombardier Challenger 604 which can fly non-stop to destinations as far as London, Rome, Geneva, Nice or Bangkok, while an eight-seat Raytheon Hawker 800XP is suitable for flights throughout the Arab world as far as Cairo. The company is aiming for a total of six aircraft by next year. SAUDI Arabian Airlines has increased the number of its weekly flights to Dubai by 14, Gulf News reported. The latest move brings the total weekly flights between the two destinations to 44. Twelve of the 14 new weekly flights between Dubai and KSA will be between Dubai and Dammam using MD90 planes, while two weekly non-stop flights will operate between Dubai and Al Madinah.